Fremantle Terrace Trendy Primaries Complex live like a local! 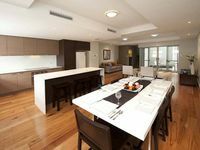 Property 10: Fremantle Terrace Trendy Primaries Complex live like a local! ParkTerraces Pet Friendly and close To Rokeby Rd. Property 15: ParkTerraces Pet Friendly and close To Rokeby Rd. E.Perth riverside T/House 150m to Shops & Eats. Property 30: E.Perth riverside T/House 150m to Shops & Eats. East Perth LUXURY- Voted WA's top suburb. Enjoy! Property 35: East Perth LUXURY- Voted WA's top suburb. Enjoy! Property 47: LUXURY ON LAKE'S EDGE! It was a nice place, however, the air conditioning was difficult to figure out and control for all levels. Could have used more tea towels, and it would have been nice to have cereal/fruit bowls.. we ended up using the smaller coffee cups. Also, we had paid for housekeeping, so not sure why were responsible for removing our bedding. We thoroughly enjoyed our stay finding the townhouse clean, well-equipped and in a quiet neighbourhood with a park and playground within walking distance. The location allowed ease of travel to various shopping centres, the city and coast. We will certainly book again for future visits to Perth.